Pasta Fruit Salad made with macaroni, fruit cocktail, sweet palm nuts, cheese, and sweetened cream. Creamy and perfectly sweetened, this Filipino-style dessert is sure to be a party hit! Pasta Fruit Salad is the follow-up recipe to chicken sisig in our 24 Days to Christmas recipe series. Since it’s an old recipe from 2013 that gets a lot of love during the holiday season, I thought I’ll update it with new photos and push it back on the spotlight in time for Noche Buena. If you’re looking for more holiday desserts, my buko pandan also got a bit of TLC and was revamped with new photos as well as a video to guide through the simple process. I also have a couple of brand new sweet treats coming your way soon so yay! Christmas is just around the corner and one dish that is almost always present in every Filipino’s holiday festivities is fruit salad. 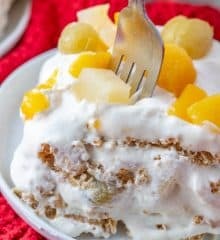 Traditionally, this Filipino-style dessert is made with fruit cocktail, sweet palm nuts, and sweetened cream but a few years ago, a friend of mine introduced me to adding macaroni to the mix. My first thought when she offered me a serving was, “what a way to ruin a good recipe” but I took one spoonful and quickly swallowed my words. The pasta cooked al dente does add a nice, chewy texture and marries well with the rest of the concoction. It’s also an inexpensive way to extend servings, especially when serving a large party. This macaroni fruit salad recipe is creamy, tasty, and easily customizable. I like to use fruit cocktail, nata de coco, kaong, and cheese cubes to pull it together but feel free to add other canned fruits such as peaches and mandarin oranges or fresh fruits such as halved seedless grapes, diced apples, and sliced strawberries. If you’d like to trim down the calories a bit, you can swap the all-purpose cream and condensed milk with this yogurt dressing for a healthier option. In a bowl, combine 1 cup plain yogurt, 1/2 cup sour cream, and 1/4 cup honey. Whisk together until smooth and well-blended. Drilled dressing on pasta salad and gently toss to distribute. For best texture, cook the macaroni about a minute shy of package’s directions. You will need about 2 cups cooked. The kaong and nata de coco are usually packed in heavy syrup so make sure to drain well. The salad will taste a little too sweet when just combined but the sweetness will mellow out once the mixture is chilled or frozen. Make sure to bookmark, pin, or print this pasta fruit salad recipe for your holiday gatherings and special occasions. I hope to see you here again tomorrow for another delicious party dish! In a large pot over medium heat, bring 2 quarts of lightly salted water to a boil. Add pasta and cook about 1 minute shy of package's directions. Remove from heat, rinse, and drain well. Let cool completely. In a bowl, combine cooked macaroni, fruit cocktail, pineapple, nata de coco, kaong, cheese, table cream, and condensed milk and cream. Stir gently to distribute. Chill for 1 to 2 hours or freeze until firm. What kind of cheese do you use? Can I use cheddar? This is my first time to visit Kawaling Pinoy, and I find your recipes interesting and very Pinoy and so easy to follow. I have subscribed to get your e-book.I hope to test-cook your many recipes. Thanks a lot! Welcome, Yolanda 🙂 I hope you enjoy the recipes and find them useful. OMG I’ve been looking for this recipe. My cousin made one like this and I could never replicate this. I will definitely try this one. The one I had was so addicting I could eat it all day everyday. Will let you know once I try it! Thanks for sharing! i followed the instruction sa package na 10min cooking ng macaroni pasta, and yet nung natimplahan ko na medyo chewy pa siya. hindi ko tulpy alam kung dapat ko ba syang iserve sa christmas party, natatakot ako bka may sumakit ang tyan dahl sa parang hindi pa ganun kalambot ung pasta. help naman pls. do i need to boil the macaroni pasta before adding it to the salad?? If you followed the package’s directions, the pasta should be fine. I think noodles get a little chewy when they’re cold. How long po ang shelf life ng macaroni fruit salad? Thanks po. Happy New Year! Hi, I just want clarify the amount of pasta. Since 2 cups dry macaroni makes 4 cups of cooked macaroni, should I stay with cooking with that measurement or still use 4 cups of dry mac? I tried using cream cheese in place of nestle cream. I also tried yogurt and they both work well for me. I believe the thickened cream you have will make a reasonable substitute. I’ve used U.S. heavy cream on the occasions I don’t have table cream on hand and it worked pretty well. I just found your website and you are awesome. I never learned how to cook till I came to the US 40 years ago. I live in the Florida Keys where the climate is almost like the Philippines and seafood is caught fresh by us. I told some of our friends who love Filipino food to visit your site to sample some of your recipes. Thank you so much for your kind words and for sharing the site to your friends. I grew up in PI, but i never learned to cook til i came here in the US. I even see recipes here that I never heard of. I think this is my new fave site for recipes. Thanks for sharing and keep it coming. Thank you for the visit and I am glad you are finding the recipes here useful. Please don’t forget to join our upcoming giveaway to celebrate Kawaling Pinoy’s one year anniversary.